"The Saudi regime does not shy from pounding anything which has to do with Yemen... This is our answer to them and to the whole world," said the Houthi leader. * * * The Royal Saudi military claims to have shot down a ballistic missile fired by Yemen's Houthi Ansarullah group toward Riyadh, in a clear response to the dropping of restraint by the Saudis and their junior "coalition" partners. The missile launch reportedly didn't result in casualties or damage. In contrast, a U.N. human rights spokesman said coalition air strikes had killed at least 136 civilians and non-combatants in war-torn Yemen since December 6. Tight restrictions maintained by the Saudi-controlled group, meanwhile, continue to prevent humanitarian aid from reaching 8 million Yemenis who are on the brink of famine. Over a million Yemenis are also suspected to be infected with cholera. The Houthi movement said it had aimed the missile at the Saudi royal court at al-Yamama palace, where a meeting of Saudi leaders was underway. It described the attack as a new chapter in the conflict. The launch came as the Houthis marked 1,000 days since the Saudi-led aggression on Yemen began in March 2015, after the widely-hated Yemeni President Abd-Rabbu Mansour Hadi was driven into exile. Riyadh has suffered heavy military losses since launching the siege of the country in 2015. Some analysts have described the brutal quagmire as the House of Saud's Vietnam War. 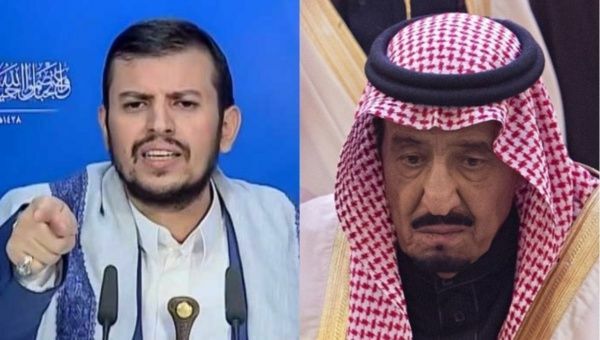 "The enemies had their own mirage calculations... but over 1,000 days, there has been this great steadfastness," said Sayyed Abdel-Malek al-Houthi, a Houthi leader, in a speech on the group's Al-Masirah TV. "Civilian and religious sites have been targeted in Yemen within the three years of Saudi war. The Saudi regime does not shy from pounding anything which has to do with Yemen. Aggressors have, nevertheless, failed to force Yemenis into submission. "This is our answer to them and to the whole world... The more crimes you perpetrate, the more tyrannical you are, you will meet nothing but more missiles." Saudi palaces, military and oil facilities are within range of such missiles, the Houthis also said in a statement carried by the group's Al-Masirah television. "We are working closely with our Saudi partners... to ensure that our Saudi partners have the resources they need to defend their territory against indiscriminate attacks against civilian-inhabited areas," the spokesman said. Saudi-led alliance officials claim the missile, the latest of several fired toward Riyadh, had been directed at residential areas but there had been no damage. Quoting the coalition, Saudi state news agency SPA continued to repeat claims by Riyadh and its U.S. and Israeli allies that the Yemeni missiles were "Iranian-made." The Saudi mouthpiece also accused the Houthis of using humanitarian entry points into Yemen to smuggle in missiles from Saudi Arabia's regional arch-foe, Iran. "Coalition forces confirm intercepting an Iranian-Houthi missile targeting (the) south of Riyadh," the government-run Center for International Communication wrote on its Twitter account while failing to note how the kingdom was able to determine the origin of the missile. "There are no reported casualties at this time." Saudi Crown Prince Mohammed bin Salman described the alleged Iranian supply of rockets to the Houthis as "direct military aggression" that could be an act of war. Last week, U.S. Ambassador to the United Nations Nikki Haley displayed parts of a missile she claimed was "undeniable" evidence that Tehran has armed the Houthi movement. On Tuesday, Iran officially lodged a protest against the "uncalculated and baseless" allegations. According to a confidential brief by a U.N. Security Council-appointed panel of experts leaked last month, Saudi Arabia has failed to provide evidence proving its claims that Iran or any other party transferred short-range ballistic missiles to the Houthi rebels in violation of Security Council resolutions. Likewise, the panel analyzed possible supply routes for sending large shipping containers containing ballistic missiles and found that any such shipment would stand a very high chance of being intercepted. While the Houthi movement has frequently faced Saudi and U.S. accusations of being controlled by Iran, the group has a unique Zaidi brand of Islam that significantly differs from Tehran's "twelver" brand of mainstream Shia theology as well as organizational autonomy from Tehran. Last August, the U.N. reported that at least 10,000 people have been killed in the conflict that began last year. The 2016 figure has not been updated since fall of last year and remains widely cited by Western media outlets, such as Reuters and AFP, despite the vast amount of casualties resulting from daily airstrikes on Yemeni villages and urban centers. Last month, Save The Children said at least 130 Yemeni children die every day from extreme hunger and disease due to the Saudi-led blockade. More than 50,000 children are believed to have died in Yemen so far in 2017, the international aid group said.